Dandruff is a circular problem: we look for shampoos to fix our flakes but many shampoos on the market include ingredients that only make dandruff worse. Ingredients like SLS and parfum make products affordable but also add serious contact allergens that send skin reeling. Natural dandruff shampoo eliminates this problem. By using ingredients derived from nature and not in labs, your scalp and hair will benefit from calming properties without all the unpronounceable, gross stuff. Before diving into the shampoos, we believe fit the bill, let’s first talk about dandruff. Dandruff has no single cause and no single cure. It may be the result of a skin condition, yeast, or fungus that send your hair’s natural oils reeling. In fact, most dandruff causes lie within your body – not on top of your head. As a result, shampoos manage the symptoms rather than curing the cause of your dandruff. It’s important to look at dandruff shampoo as a whole in this light. Too often, we rely on it to be the ultimate cure for dandruff when in reality, we have to fix whatever it is that causes it, not simply manage the build-up of dandruff on our heads, which is what shampoo does. Shampoo can be a wonderful tool for controlling dandruff, but if you struggle to find any shampoo to help you deal with the symptoms, consider seeing a doctor or dermatologist to address the underlying issues. With that, let’s look at some of the best natural dandruff shampoo products currently available. Before ordering a new shampoo, you need to know that what you’re buying is not only right for your hair, but that dandruff is your problem. Dandruff appears in flakes and is often accompanied by an itchy scalp (usually with scales). The most common dandruff is white and oily with the flakes building up on your scalp, in your hair, and falling onto your shoulders. You might find it gets worse during the latter half of the year when the air outside is drier or you use your indoor HVAC system too frequently. If you find you have larger, discolored scales, you might confuse them with dandruff, but they might be a symptom of a more serious skin or health condition. Visit your doctor or dermatologist to learn more and find potential solutions for your scalp issues. Want to find the right shampoo without going through 5-10 bottles first? Buy haircare products based on the cause of your dandruff – not just the presence of dandruff itself. Dermatitis caused by products like shampoo, hair gel, sprays, etc. But dandruff is also impacted by your health, lifestyle, and your genes. For example, people who have Parkinson’s disease are more likely to have excess oil and thus have a higher risk of dandruff. It may also be something you experience during adolescence but goes away as you reach adulthood. Even if you’ve never had dandruff before, it may develop as you get older. Reach out to others to see what shampoo best works for their scalp – it will tell you more about why your shampoo is or isn’t working. Most of the common dandruff relief products come in the form of special shampoo formulas with active ingredients. Some target ‘dandruff’ in general while others hunt down ingredients to tackle the underlying cause like dermatitis or skin cell production. Finding the right ingredients is important if you’re dealing with anything more than everyday or common dandruff because the other products will only attempt to mask the problem rather than solve it. Moreover, the wrong dandruff shampoo might even make the problem worse. Zinc pyrithione is an antifungal and antibacterial agent found in common shampoos like Head & Shoulders. Although fungus doesn’t directly cause dandruff, it can encourage the grow of excess skin cells. Shampoo manufacturers use this ingredient to slow down the growth of skin cells to a normal rate thereby reducing flakiness. Coal or tar also slows the skin cell reproduction process and is used by people suffering from common dandruff and severe psoriasis. We choose our products using a unique method that compares manufacturer information, the latest research, and customer and professional reviews. By combining all this information, we’re able to see what products truly stand out in the marketplace. Our commitment to a qualified rating system runs deep, particularly among beauty products. Unlike other products, hair care items are highly subjective. An amazing, restorative shampoo for one head of hair may leave someone else with tired, dull hair and an itchy scalp. By using ingredients list as a starting line and combining them with lived experiences, we’re able to show you what products might best work for your unique head of hair. 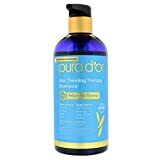 PURA D’OR’s formula is designed to target both dandruff and dry scalps using a natural formula to remove build-up without over-drying. People love PURA D’OR’s shampoo because it offers an alternative to the dandruff solutions that include nasty ingredients like SLS. Instead, the manufacturer created its own formula based on ingredients it believes in most: plants, proteins, extracts, and oil. The shampoo is protected by eliminating preservatives that often antagonise your skin and scalp: the formula is so safe that it received a USDA Certified Biobased Product rating of 75-95%. People who try this shampoo tend to find that it takes a few washes or even a few weeks to work properly. It’s also a favorite of customers who have Sebherric Dermatitis. Make sure to follow the manufacturer’s instructions and leave the shampoo on for up to two minutes. Those who’ve tried it say the shampoo simply doesn’t have the same effect if you wash it out immediately. Overall, we give it three out of five stars because it has natural ingredients and lasts for months, but it doesn’t provide anywhere near instant relief for dandruff and itchy scalps. Sage isn’t a common ingredient in shampoo, but it could soon be. It’s used in traditional medicine to fight inflammation and for its antiseptic properties. You’ll find it most often in products to combat dermatitis. Rosemary works with the sage and tea tree oil to stimulate hair growth after the other oils wipe out the old dead cells. Spikenard performs a similar function in taking on dermatitis with the added benefit of restoring pigmentation. The argan, jojoba, and botanical keratin all restore your hair and scalp through their moisturizing and replenishing properties. Though, keep in mind that some find jojoba oil encourages oil production and worsens dandruff. In addition to using a formula based only on natural ingredients, the Maple Holistics shampoo is also vegan, gluten-free and cruelty free. One of the reasons we recommend this product is that when it works, it works quickly. Customers have reported a decrease in dandruff in only one wash. 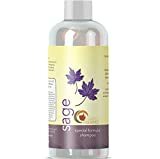 These people often found that drug store brands tended to help the problem but not fix it; however, the sage shampoo make the biggest difference in regard to the number of flakes they found. The other reason we recommend it is because of the smell. So many dandruff shampoos smell okay at best and often outright terrible. The combination of oils in this shampoo creates a spicy smell that many find they’re better able to adjust to. Only one issue exists: the bottles are typically small – between 8 and 16 ounces. You may find yourself ordering a new bottle every few months or relying on stockists to continue stocking it long- term. Giovanni Tea Tree Triple Treat Shampoo is a lesser known brand that uses tea tree oil to get rid of flakes and help you finally achieve that clean feeling. The full ingredient list isn’t provided, but it does include a plant-based formula based on the organic oils derived from renewable plants. The shampoo includes three oils including tea tree oil, but the other two oils aren’t listed. It’s hard to find too many reviews for this shampoo, but it has been mentioned in beauty roundups. You may start to see more of it in the future. We can only give it three out of five stars because of a lack of data, but it could be one to try if you’re running low on options. 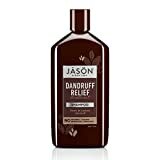 Jason Shampoo Dandruff Relief is the key player you’ve never heard of. It contains a formula similar to other natural dandruff shampoo products with one key difference: colloidal sulfur. The combination of rosemary oil, olive oil, and jojoba helps alleviate dry scalps, just as others do. But people who use this product agree that the real winner is the colloidal sulfur that works as a triple threat to get rid of not only the dryness but also the flakes and the itch. It’s a shampoo that reviewers say they can no longer live without. We give this shampoo five out of five stars because it uses its ingredients to truly go the distance.